Three times a year, the Old Mission Santa Inés Society of St. Vincent de Paul Conference holds "Bundle Sunday" events to collect usable clothing, shoes, appliances, household items, books, jewelry, etc. for distribution to the needy in our community and to the Los Angeles Council Thrift Store that has been in continuous operation since 1917 and serves over 150,000 customers annually. The council shares part of the proceeds of Thrift Store sales with conferences who provide donations. 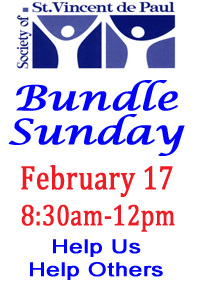 Bundle Sunday event dates are advertised in advance on this webpage, in the parish bulletin and by weekend announcements prior to the event.